The picture isn't scale and is pretty crude, but it's worlds better than anything I could sketch out by hand. I already have the tanks, steel for the frame work, and possibly the pipe for the chimney on hand. I'll try to get a couple of pictures of the tanks up tomorrow for reference. The numbers are from Feldon's online calculator. I'm sure there's going to be many, many changes before it is finished, but one has to start somewhere. Suggestions are welcome and encouraged. I switched to the smaller air tank because it is close enough to the right dimensions that I won't have to cut it down - that and I totally forgot I had it. 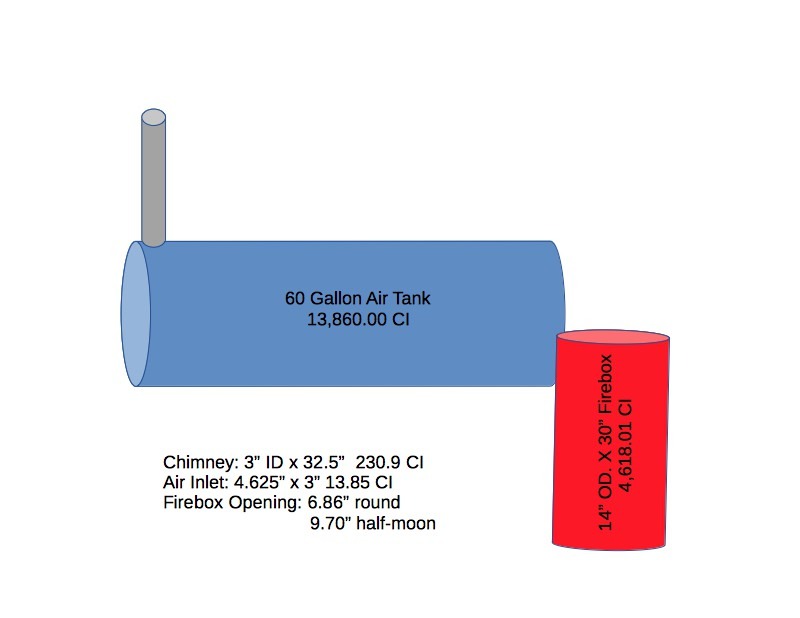 I'm not a builder but have been paying attention to how different smokers are designed and I must say that the true offset with firebox at one end is starting to lose out to ones designed with the firebox running across the back of the cook chamber with more than one connection for the smoke to access the cook chamber. Here's one of Franklin's newer smokers..(too bad it took a fire disaster for me to be able to grab the picture). Chasdev wrote: I'm not a builder but have been paying attention to how different smokers are designed and I must say that the true offset with firebox at one end is starting to lose out to ones designed with the firebox running across the back of the cook chamber with more than one connection for the smoke to access the cook chamber. I'd love to get a close look at Franklin's rear burner rig.. wonder if the fire feeds from both ends and what the connection between the firebox and cook chamber looks like. Probably never know, or at least not soon enough to make any difference. Chasdev wrote: I'd love to get a close look at Franklin's rear burner rig.. wonder if the fire feeds from both ends and what the connection between the firebox and cook chamber looks like. Looks similar to the one used at Pecan Lodge. You can see in their pit room from the outside dining area. I agree KAM, once you get an offset tuned up and flowing properly, its unbeatable. 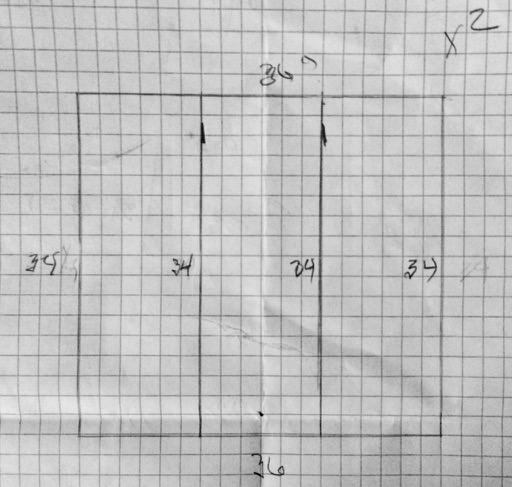 After several frustrating hours of sketching out designs for a stand for the smoker that the math would just not work out right (taught math for 12 years ), my wonderful wife suggested that I was over thinking things a little bit (guilty ). After a good nights sleep, I started over completely and within an hour I had a sketch with dimensions that actually worked. That woman just knows me too well. 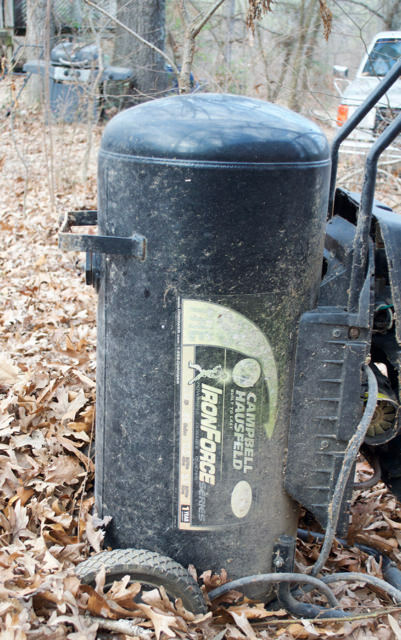 I'm going with a modified sawhorse design that should let the tank settle into the frame about 2" below the centerline angling out to a wider stance for stability. I'm planning on cutting metal this afternoon and maybe tacking it together if the rain stops for a little while. If I get that far, I'll post up the results this evening. 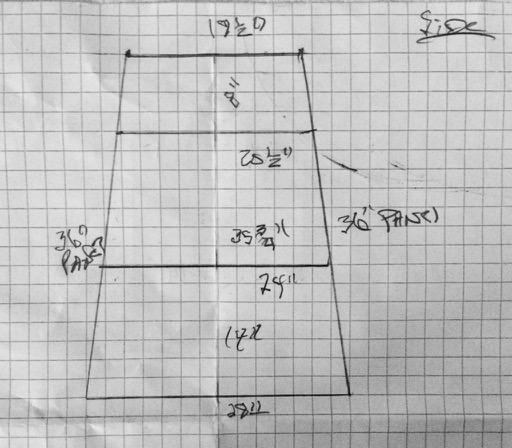 Post you sketch and we will see if the design is solid. Could save you some work/money/stress. I’d love to, but my computer is on the fritz and I can’t resize pictures to meet forum requirements. 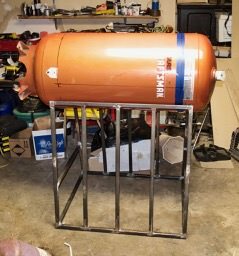 When put together, it will form a cradle that the 60 gallon air tank will nestle down in and hold it while I complete the work on the tank & firebox. 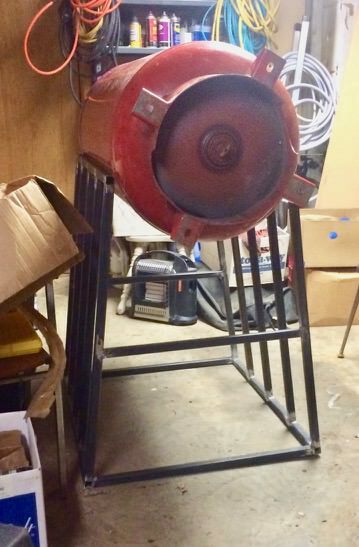 Once that is all put together, I will true everything up and weld the stand to the cooking chamber. Or at least I will when the weather warms up and dries up enough for me to do some more welding. Working outside really stinks at times. 1. Do you think I should add additional horizontal bracing on the stand? 2. 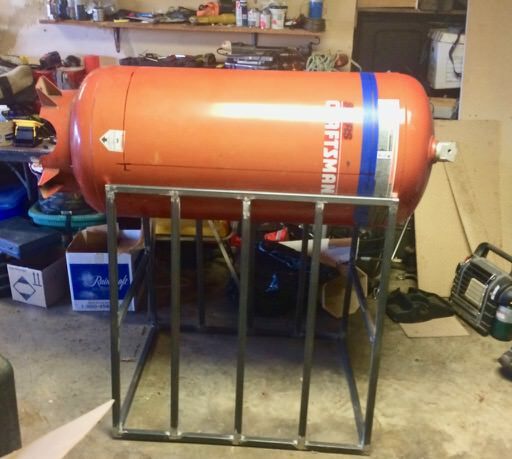 If I decide to make this a reverse flow smoker, what gauge metal should I use for the baffle? I've got pork ribs in the micro smoker going that should be done sometime soon. Got to looking at it this morning and realized that the frame was no where near square. Some cutting, grinding, and welding later, it's back on the stand. I narrowed the distance where the cooking chamber sits so it sits a little higher, but I'm ok with that.